This slot from Novomatic Casino is great if you love vampire themes. If you like Bloody Love's magical theme, you may also enjoy Win Wizard, Unicorn Magic, Pumpkin Power and The Alchemist. Bloody Love features 10 fixed pay lines and five reels to give you plenty of ways to win. There are also bonus features to boost your bankroll. The game's background includes bare trees and shadowy figures set against a foggy full-moon night theme. Nosferatu stands to the right of the reels watching your every move with a big grin. The cartoon graphics are crisp and fun, and the reels spin smoothly. You can play the game on most browsers, and it is compatible with most operating systems. You should have the latest version of Adobe Flash Player for optimal quality. Betting is easy since the 10 pay lines are fixed. You can choose a line value between .01 and 50 coins. This makes the minimum bet per round .10 coins and the maximum bet per round 500 coins. You can change your bet between rounds if you wish by adjusting the bet value per line. The start button activates the reels. If you spin three or more scatter symbols, you win between three and 15 free spins. Scatters pay at any screen position, and the trigger bet is used during the spins. You cannot trigger more free spins while you are using free spins in this game. You are probably familiar with the bonus game if you have played Spectacular, Cash Farm or similar Novomatic casino slots. The bonus game requires you to guess the colour of a face-down card. You have a 50 percent chance of winning and doubling your bet if you click the gamble option after a win. The gambling feature can be repeated several times to give you a big winning potential. Your win is doubled each time. For example, if you gamble a win of 60 coins from the reels and win, you earn 120 coins. You can collect it or gamble it for the chance to win 240 coins. If you win the 240 and choose to gamble again, you have the chance to win 480 coins. You can turn the slot sounds off or on by clicking the speaker icon. To play the game in full-screen mode, click the expansion tab at the top of the screen. There is an autoplay feature. However, it is manual. You cannot set a number of rounds or a loss threshold. You must click stop to exit auto mode. The paytable screen shows the characters and values. If you want to read an explanation of the scatter rules and see the individual pay lines, click the info tab once and then once more while the paytable is open. 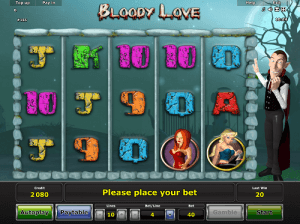 As it is with Twisted Pays, Bear Tracks and other slots, you can play Bloody Love for free in demo mode until you are familiar enough with it to make a wager. There are many other fun slots from Novomatic to try when you want a break from Bloody Love. Marilyn Red Carpet features a star-struck theme that pays homage to the late Marilyn Monroe. Chicago is a fun game if you like mafia or gangster themes, and Big Catch is enjoyable if you like fishing. For a different experience, try Novomatic's electronic table games such as blackjack and roulette.